First Line: "Are you sure this thing works?" Danny asked Mr. Singh, the gizmo man. If ever there's a man praying that he can get out of his latest assignment, it's Peter Diamond, but he has the proverbial snowball's chance. It doesn't matter how high the work is piled on his desk, Assistant Chief Constable Georgina Dallymore insists that he accompany her on an internal investigation. A detective in Sussex has been suspended for failing to link a relative's DNA evidence to a seven-year-old murder. It's a serious breach of ethics made worse by the fact that Diamond knows and likes the suspended officer. But he also knows that this particular officer is a very good one and not prone to making mistakes. As Diamond begins to investigate the cold case, he begins to see connections between it and an art teacher who's recently gone missing. How many other disappearances in the area have gone unnoticed? Dallymore and Diamond have stumbled into a nest of related crimes, and it's up to Diamond to straighten them all out. Peter Lovesey is back with a winner in this fifteenth Peter Diamond mystery. What better than to pair up Diamond with his superior officer-- a woman he has no use for? Some of my favorite scenes in the book deal with Diamond learning how to conceal crucial pieces of his investigation from his hapless partner, and readers can easily feel sympathy for him each time he has to stop what he's doing to stroke his boss's ego. Even "Dallymore and Diamond" has the ring of a vaudeville act whose name appears at the bottom of the bill. It's not a situation that Diamond relishes. At. All. Another thing to make Diamond's job more difficult is the fact that he has to keep his friendship with the suspended officer, "Hen" Mallin, a secret from his boss and everyone else. Mallin has appeared in other Lovesey mysteries (The Circle, The Headhunters and The House Sitter), and I enjoyed her character so much that I'll be looking these two up in order to read them. 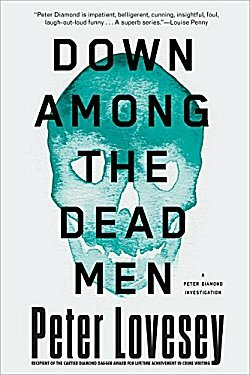 Down Among the Dead Men also concerns missing persons, a handsome young art teacher who has set all the hearts at a posh girls' school aflutter, Saturday meetings for a group of local artists, and full moon parties. Lovesey does such a good job of portraying all those teenage female hormones that I felt as if I were right in the middle of the action (and wanting to run for my life). There are so many things going on in this book, but I never once felt confused or overloaded. Lovesey has created a very complex puzzle, and I loved how all the various pieces finally slotted into place-- some not exactly in the places I expected. Yes, this is a book in which I often knew "who" but very seldom figured out the "why" or the "how." When you finish reading Down Among the Dead Men, you'll have a smile on your face, knowing that you've just been given a lesson in deduction by a master. That's the thing about Lovesey, Cathy; he can weave together a very complex puzzle without confusing the reader. And I do like his Peter Diamond character. I'll admit I've not read this one yet, but I can just imagine the interplay between Diamond and Dallymore! Worth the price of admission, Margot! I haven't read any in this series yet. Sounds quite interesting. I'm a rather late convert to the series, Pepper. I've been told that some of the earlier titles are absolutely brilliant, and I have copies waiting patiently for me on my TBR shelves. Well, neither cover grabs me enough to entice me into reading the book. The U.S. cover at least implies there is a death and is mysterious. The British cover is of an old mansion which could be anywhere in rural England, but it does not imply a mystery or doom or death. It really could be the cover of any novel set in rural England. What compels me to read the book is your review. However, for U.S. readers, I think the U.S. cover is better; for British readers, it's their cover. Each is appropriate.